Consider this a “State of the Union Address” for anyone who’s interested / curious in what’s happening around YouMotorcycle. We’ve got a whole lot of reviews, personal reflections, tips, info, and motorcycle event and ride reports lined up for spring. About two years ago YouMotorcycle was pumping out a lot of motorcycle reviews. Back then I worked in the motorcycle industry and test rides were easy to come by. At the end of 2013 the plan was to expand YouMotorcycle’s network, and we now have access to even more motorcycles and products to test and review. Requests for reviews from motorcycle parts and accessories manufacturers have been growing. We’ve even seen a handful of new advertisers and sponsors. A few months ago we added a little web shop feature to the website. It only had two products. The idea was to create a web store that only contained products that you’d recommend to your own family, friends or loved ones. We’ve expanded the little web shop to 30 key items. The items in the shop are selected based on our own personal experience with them. Anything on the store is either something that we either own or have used extensively. If you see the product on YouMotorcycle, you can trust it. One day there could be 50 or 100 products on the site, but that won’t happen until we’ve run the gauntlet with all of them. Take those GoPro cameras for example. Sure they’ve got great reviews, and cool videos, but I won’t vouch for it until I’ve used one. UPDATE: I had an email asking about motorcycle batteries. For a handful of reasons (variety, availability, shipping of chemicals, etc.) we won’t be adding them. It’s something we’ll leave for the big boys. My recommendation: check out the Yuasa batteries. They’re typically a little more expensive than their competitors, but they’re the only brand of motorcycle battery that I trust, and they easily last half a decade. To those who have supported the web store up until now, thank you! To those who haven’t checked it out yet, please have a look. – bikerMetric just launched its first newsletter. If custom metric bobbers, choppers, and cafe racers are your thing, click here. – We’ll be launching a new $100 giveaway for motorcycle reviews. Simply put, you send us in an honest review of your motorcycle(s), and if we publish it you’ll have a 1 in 10 chance of winning $100. – I’ve moved in to a house fit for motorcycling, and I’m working all night long to get it ready now, before the perfect riding weather arrives. Expect a quiet April, followed by a very busy May! – After back to back record breaking months, YouMotorcycle and bikerMetric combined to make $1,000 in net profit in March of 2014. When I calculated the hours of work I did, I’m actually almost making minimum wage! Not bad for a hobby? Much thanks to the visitors who click those links and to the sponsors and advertisers! Thank you all, and ride safe! why use a US Image for a Canadian website? 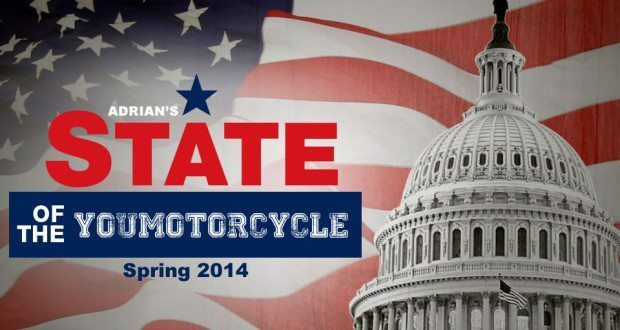 Because it’s easier to play on State of the Union Address (State of the YouMotorcycle Address) than it is to play on the Throne Speech. Not to mention the State of the Union is much more universally recognized. Not to mention the Capitol Building is, let’s face it, way cooler than than the Finance Minister’s new shoes.